Penned version with tablet (Wacom Bamboo) then tweaked a lot with mouse. Not sure how much value the tablet added, it was quite sloppy. Some basic colouring with the original colours. Some further colouring and added some highlights. Quantised the colours to the MSX palette. 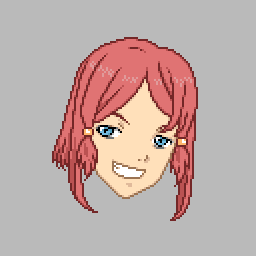 Colouring and shading of the hair, more details, anti-aliasing, polish, and narrowed the character to improve the proportions, especially the eye distance is noticeable (lasso tool is great). One snag I ran into is that since on MSX pixels are not square but slightly rectangular, the MSX image looked quite stretched. Narrowing the face helped a lot but it still looks a bit stretched. Something to keep in mind in the future. 14 colours used, 15 if you count the background. I spent about 4 to 6 hours on it (two evenings). 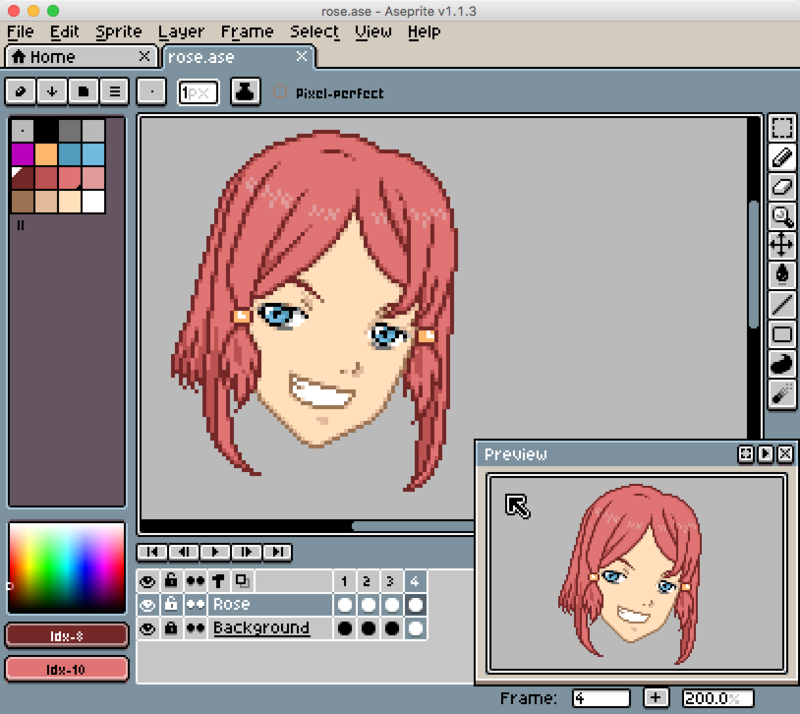 For the image editor I used Aseprite which is not free but only a few bucks, and is a really good editor for pixel art. Good palette support, supports a transparent colour, layers, animations, etc. What are your thoughts? I think it turned out pretty well. 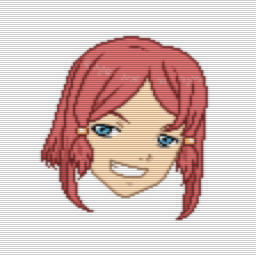 I’m wondering if I overdid the anti-aliasing in the hair; it smooths the edges but also adds shadow details that weren’t there originally. Is it maybe better to remove some anti-aliasing pixels at the cost of some sharper edges, you think? Please let me hear your critiques. Next time I’m going to try to create an original drawing. Lately I’ve been working on a gzip (.gz) decompression implementation for MSX, which as of yesterday is functional. 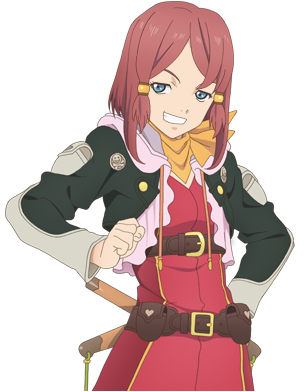 Although I’ve been developing it for VGMPlay, I’ve implemented it as a stand-alone “gunzip” utility. And of course it is open source and liberally licensed, so you can reuse the code in any way you want. Note, this is just a test with a single file, however it shows the general trend. I’m pretty happy to see this result, it follows from the efficient approach I took to decoding the huffman tree. Skipping the checksum verification further improves speed by 25% (turboR 20s 13s, MSX2 100s 55s), however I’ll let the code settle for a while before I expose that as a command line option. Finally, I’ve tested with a fairly large set of gzip files, but if you encounter any errors, please send me the gz file to test with and I will fix it. My most recent side project is Glass, a Z80 assembler. It’s cross-platform, using the Java 7 runtime. The first version focused on getting it on par with other assemblers in terms of features. It supports regular and repetition macros, and block scopes. A little more advanced feature is that you can reference into scopes by using the dot (.). Recently I also added virtual space definitions and code sections. In the future I’d like to add some more advanced features, which prompted me to make an assembler in the first place. Some ideas are extending macros to make them more useful for class definitions, multi-compiling procedures, static analysis, automatic optimisations, and debug output with timing information. Although often better handled with subclasses and polymorphism, enumerations can be a convenient light-weight way to indicate some kind of state or non-boolean flag. A downside of this approach is that it is not type-safe; these values can not be distinguished from any other number. Additionally, it is possible to cheat by hardcoding a value somewhere, which makes code less readable and refactoring a lot harder. When one of these is passed to a method its type can be checked using instanceof or a function like checkTypes(). And because these are unique object references they are impossible to specify without using the constants.